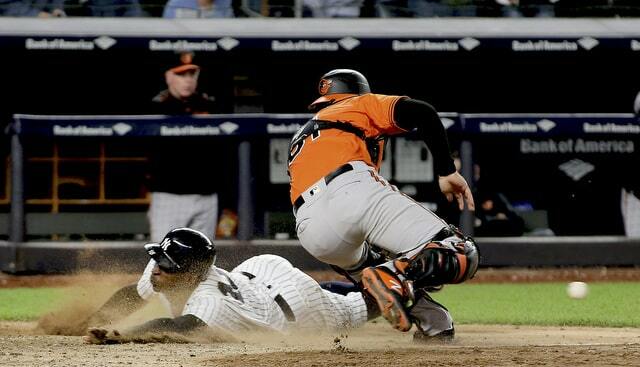 Despite clinching a postseason spot, this past weekend did not go well for the Yankees. They lost a bullpen game to the 110-loss Orioles yesterday and also lost Didi Gregorius to torn cartilage in his right wrist. He suffered the injury when he slid into home plate on Aaron Hicks’ postseason berth clinching walk-off double Saturday night. Baseball is cruel. I have some thoughts on the injury, so let’s get to ’em. 1. For what it’s worth, Gregorius described it as a “slight” tear, and, as far as returning this season goes, he said his level of optimism is “high” because he’s already feeling better. That’s good. Certainly better than the alternative. Didi suffered the injury Saturday but felt fine the rest of the night. He woke up sore yesterday and went for tests, which revealed the cartilage tear. He was given a cortisone shot and now he and the Yankees are in wait-and-see mode. 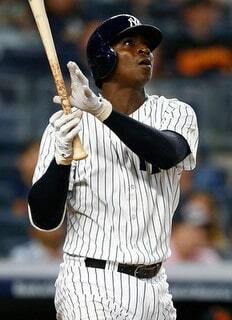 The hope is the cortisone shot will kick in and Gregorius will feel better in the coming days, and be able to return to the lineup at some point soon. The season ends one week from yesterday, so it has to be very soon. The internet tells me torn wrist cartilage is a fairly common baseball injury that can have a recovery time as short as a few days and as long as a few months. Every injury is different, so we’ll have to see whether Gregorius falls into the former recovery timetable or the latter. Fingers crossed. 2. So what do the Yankees do at shortstop in the interim? Probably exactly what they did when Gregorius was on the disabled list with his heel injury, meaning put Gleyber Torres at shortstop with Neil Walker and Ronald Torreyes filling in at second base. I love Torreyes, he’s a fun player and a quality utility guy, but I’d roll with Walker at second base full-time going forward. Torres at short, Walker at second, then replace Walker for defense in the late innings of close games. That’s the way I’d go until the Yankees clinch homefield advantage in the Wild Card Game, assuming they manage to do it at some point. Once they clinch — if they clinch! — they can relax a bit because their remaining games will become meaningless. Until then, Gleyber at short and Neil Walker is the way to go. Adeiny Hechavarria is a great defender. I don’t want to see him in the batter’s box more than I have to though. 3. Good thing the Yankees picked up Hechavarria, huh? Right before the August 31st postseason-eligibility deadline too. They’ve needed him more than I expected. He helped fill-in while Gregorius was out with his heel injury and he’s also stepped in as a defensive replacement pretty much whenever the Yankees are leading. Hechavarria can’t hit all — he owns a .252/.283/.345 (69 wRC+) overall batting line this year and is 4-for-18 (.222) with a homer for the Yankees — but he’s very good defensively, and if push comes to shove and the Yankees have to start him at shortstop while Gregorius is sidelined, his glove will make him something better than replacement level. At the time of the trade, it seemed like a bit of a weird out-of-nowhere move because the Yankees do have Walker and Torreyes and Tyler Wade as reserve middle infielder options, but gosh, Hechavarria sure has come in handy. Now he might have to take on an even larger role than defensive replacement and utility man. 4. With Gregorius out the Yankees are down to two left-handed hitters in the starting lineup, and they’re both switch-hitters: Aaron Hicks and Walker. There’s no reason to play Brett Gardner and Greg Bird over Andrew McCutchen and Luke Voit, respectively, right now. Until the top wildcard spot is clinched, McCutchen and Voit should play every single game. Didi’s injury leaves the Yankees really short on left-handed thump, which might not be a big deal this week, but it could become a real problem in the Wild Card Game. The Athletics have a very right-handed pitching staff — Ryan Buchter is their only lefty reliever and Brett Anderson is their only lefty starter, and he’s not expected to start the Wild Card Game — which means the Wild Card Game could become dominated by right-handed pitcher vs. right-handed batter matchups, at least when the Yankees are batting. That’s not good. Gregorius provided some lineup balance in addition to being an all-around awesome player. Torres is great and Walker is an okay fill-in. Neither guy is Didi though. Having to potentially go into the playoffs without him is a scary thought. 5. Know what makes this injury especially bad? The Yankees still don’t have a fully recovered Aaron Judge. Judge is 3-for-20 (.150) with seven strikeouts since returning from the disabled list and, while it is a very small sample, the average exit velocity of his 13 batted balls is 85.8 mph. Yikes. His timing is not there, understandably. Judge missed two months and didn’t have a proper minor league rehab assignment. Of course it’s taking him some time to get back up to speed. But now the Yankees have what amounts to a rehabbing Judge and no Gregorius, and they might have to go into the postseason with a rehabbing Judge and no Gregorius. That is a major bummer. A major bummer and a major blow to the offense. The team’s best hitter (best player, really) is not all the way back yet and their best left-handed hitter is on the shelf. There’s still enough firepower in the lineup to overcome that, at least in theory, but it sure would be nice to have everyone healthy and productive going into the postseason. Now that seems very unlikely to happen.